The Salt action has really come to a halt. Unfortunately, the later than normal run this year is really working against us now. Mother Nature will certainly be looking to slam the door on us at any moment. At right is a good friend of ours who was intown from VT. He managed to make the most of his trip to NJ. Switching gears - the rain train continues here in PA. This will be the third fall in a row of way above normal precip. We look with great optimism to the '05 season!! Take a look at the chart to the right. 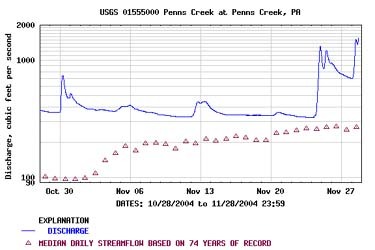 As you can see - Penns Creek - has been running at an impressive pace for quite a while now. It looks like all of us will have to perfect those hi-water nymping skills come next year. 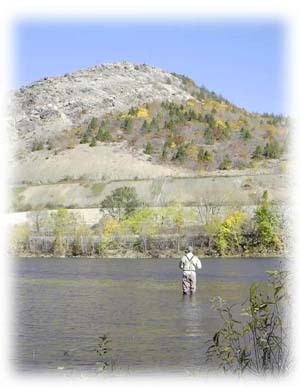 Effective fishing flows are 900cfs or less at the gage on the project waters. Here is a good site for PA rainfall totals. Now is the time to hit the NJ salt! This past week has seen some great action...and there is no reason why it should not continue. Every year is different and this year the blanket bait conditions seem to be a few weeks later than normal. But for the predators all is right on schedule! Get down there now! Who says NJ is a crowded place!? All we've been findin' is miles of empty beaches and nothing but bass n blues n bait. Need any tips or info - shoot us an e! 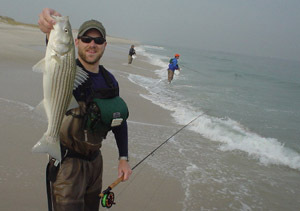 For the shorebound angler this year, so far has been hit and miss. 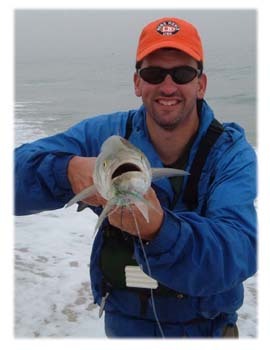 Add to that us PA anglers - who have to travel more than one, two or even three hours - and the odds get slimer. Yeah, we have hit some fish...but the action has been very inconsistent. 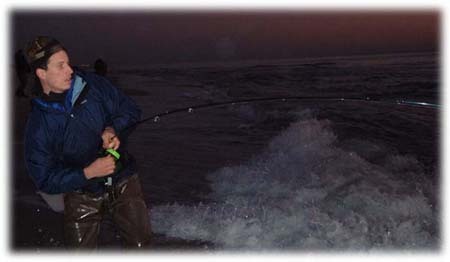 At times we have been able to dredge up some bass and blues from an otherwise 'dead' looking sea, but there have also been times of thick amounts of bait, with nothing underneath it. Talk about frustrating!!! You just never know what is gonna happen. We are still optimistic though, however it is hard not to think that that 10-day, stiff north-north-easterly wind, which we reference back in late-October, may have really screwed things up in the long run. Pictured at right is most likely the most important baitfish for us fly rodders to imitate - Menhaden, aka - bunker, baby bunker, peanut bunke for us mid-atlantic folks. Take some time to research it - you might be amazed at just how much this little fish is part of your daily everyday life. Time will tell though! All you can do now is get in the truck and hope you get into action. 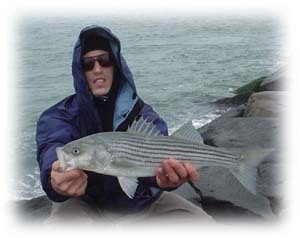 By far the most consistent shore fly rodding action, when weather permits, is north Jersey. Say from LBI northward. The steep beaches and for the most part, a steady flow of baitfish have kept the preditors somewhat close to the beach. 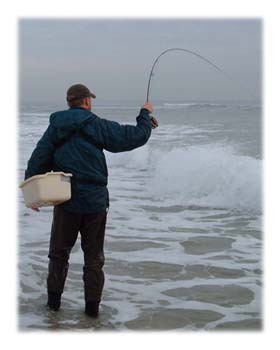 False dawn hook-up along the beach front! Forget that beauty sleep!! so it might be a good time to give you local waterway a break for a bit. Actually, for a change of pace, just walk the banks - leave the rod at home - and see what you come across. This time of year can bring out the big boys and girls to do their thing. You might actually learn some new water at the same time. November 3, 2004 - Lehigh River/Salt Report! We hit the river again this past Sunday. It was another beautiful fall day on the River. After last weekend we could'nt finish the season on such a low-note so we scrambled and were rewarded with a nice afternoon of fishing.Water temp was 53 degrees with air temps in the mid 60s. Flow at the Lehighton gage was about 1,000cfs. Walnutport was running about 1,500cfs. This is a prime level for floating. The action came and went, depending on the stretch we were on. Some runs were dead, while others were much more active. We landed two browns on streamers and buggers and we also ran into a pod of about 5-6 surface feeders very tight to one of our favorite banks. Out of that group we hooked two, but both ended up as long distance releases. 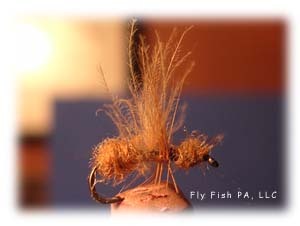 One was picked up on a size 18 BWO emerger and the second on a size 16 cinnamon flying ant. There were just a few small BWOs hatching. The topwater action was a nice way to possibly finish up the year - unless Mother Nature says plays it nice. Over the past few days the salt action has really heated up. The main baitfish of choice has been bunker. Now is the time of the year when you can witness all out carnage along the beachfront!!! It can be intense! When you get a window in the weather like we've had the past few days - go for it!! The fish above was picked up over the last few days. Pictured above is a very effective terrestrial pattern - cinnamon ant..
More of the scenery along the Lehigh River.